This is the latest in a long line of books by George Barna. Of course, being the founder of a polling company, the books are always filled with interesting charts, graphs, polls, trivia and material for illustrations. Beyond the statistical use, however, I have not been a fan of Barna’s ideas and philosophies of ministry. This book will rank high on my list of objectionable philosophy. A good example of my objections would be the proposition that in the gospels Jesus did not say anything about how a church should be structured, only about general principles of world evangelism, and therefore the Bible does not speak about such things (p. 175ff). 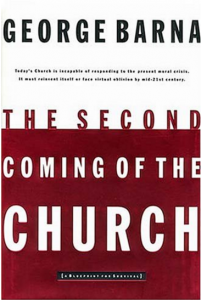 The reason for the title is that, according to Barna, the church will take such a totally different approach to the next century that it will bear little to no resemblance to what we know today (lay leadership only, pastors only as teachers, no membership, attendance in multiple churches, fathers as home-pastors, less use of scripture, emphasis on individual vision for each ministry). To Barna, this is truly a second Pentecost.